DOWNTOWN — Get out your opera glasses and glow sticks. The sweeping, dramatic arias of opera meet the bass-thumping, clubby beats of electronic dance music, or EDM, in a new genre called "Optronica." 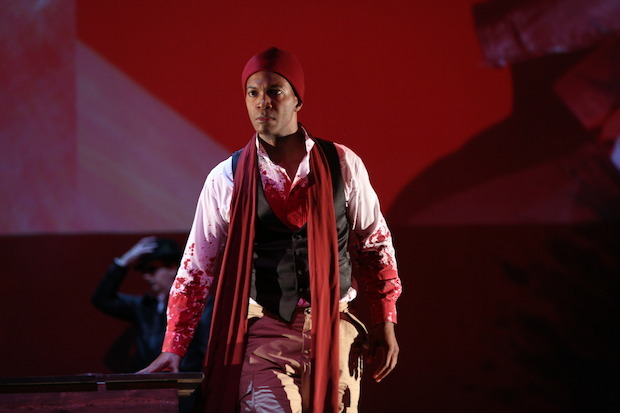 The genre is the invention of Los Angeles native Nmon Ford, who is currently performing the lead role in Ernest Bloch's "Macbeth" with the Chicago Opera Theater. To get a behind-the-scenes look at "Optronica," check out the video. Opera and EDM may seem like opposing genres, but Ford said they complement each other well. In an EDM song, the heavy bass "drop" in the song functions as the same type of cathartic moment you'd find in an opera. "When you hit a climactic note in an aria, especially if it's a well-known one that everybody's waiting for ... the entire audience just kind of releases and then goes on through the rest of the aria, just like somebody who's dancing to a track in a club," Ford said. "When that drop hits, you get that release, and you just keep on dancing." Ford combined his classical opera training with the styles of two collaborators: R&B artist Loreta and DJ Braxton Millz. The three formed the group "Optronic" and the stage show "Optronica," which will premiere Oct. 18 at Occidental College in Los Angeles. Like the multimedia staging of "Macbeth" at Harris Theater, 205 E. Randolph St. in Millennium Park, Ford said the "Optronica" show will feature video footage, dancers, a string ensemble, and, of course, Ford singing live. In Chicago, "Macbeth" has two more performances: 7:30 p.m. Friday and 3 p.m. Sunday. Tickets range from $35 to $125 and can be bought here.